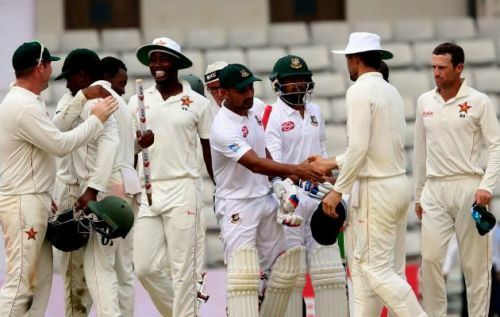 Bangladesh and Zimbabwe are all set to lock horns in the second and final Test of the series. The series opener took place in Sylhet, and the second Test is slated to be played in Dhaka from 11 November. Zimbabwe won the first Test of the series in Sylhet, which was the very first Test hosted at the venue. They outshot the hosts by 151 runs, as their spinners played a centre rule to control the match. And thus, Zimbabwe registered their first Test win in five years, which was also their first in 17 years away from home. They last won a Test abroad back in 2001 against the same opponent. While Zimbabwe are looking to secure a series win over Bangladesh, the hosts are looking to bring some changes in the playing XI. Bangladesh played the first Test with only a pacer, and have played three specialist spinners. Bangladesh might bring in at least three changes in the next match as the interim captain Mahmudullah Riyad hinted in the pre-match press conference. He says: “We are thinking to make some changes in the playing XI, but it is still unsure who will get a chance." Though Mahmudullah did not reveal, it is understood that the Tigers might bring Mustafizur Rahman back to the playing XI, replacing Nazmul Islam Apu. Along with him, Mohammad Mithun and Khaled Ahmed might get their Test caps in the places of Nazmul Islam Shanto and Abu Jayed Rahi. While Mustafizur was suffering from a minor injury before the first Test, Mohammad Mithun and Khaled Ahmed were ignored for strategic reasons. Mohammad Mithun, the right-handed wicketkeeper-batsman, has proved his limited-overs prowess for the Tigers, which paved his way to the Test team. He has played a total of 88 First-class matches and scored 3430 runs in an average of 33.62. Khaled Ahmed is a right-arm medium pacer who has played 20 First-class matches and taken 48 scalps. He has three five-fors to his name.